Stephan Widera is a German photographer, painter and mixed media artist. Widera’'s (often multi-media) works include also installation, film and writing. Characteristic of his work is the way in which he mixes different genres and artistic techniques. He Widera was born in Bremen, studied design in Krefeld (Hochschule Niederrhein) with Professor Günther Dohr and Pprofessor Rolf Sachsse and became a visual artist. After graduating, he moved to Düsseldorf and met the artist Paul Schwietzke. Together they collaborated on many occasions and formed a group of contemporary surrealistic artists. In his works, he Widera explores the absurdity of modern life, technology, politics, society and media –- often in a humorous way. 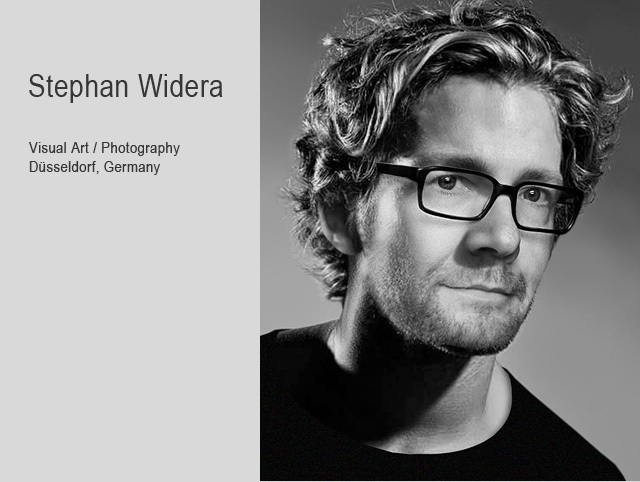 Stephan Widera’´s works have been shown in numerous solo and group exhibitions in Germany, Europe and the United States, in Galleries, Museums and at Art Fairs. Beside private collectors his works have been purchased by companies like Agfa, Deutsche Bahn, DiBa Bank, Ford, Lufthansa, Rémy Martin, Rewe, Shell, Deutsche Telekom, Toshiba and several advertisig agencies. Stephan, Stephan Widera, Widera, Bremen, Düsseldorf, Painting Duesseldorf, Dusseldorf, Surrealistic painting, art, contemporary art, contemporary artist, , painter, artist, visual artist, visual art, visual arts, fine art, fine arts, NRW, Deutschland, Germany, Surrealism, Surrealism, Surrealist, contemporary Surrealism, Düsseldorf artist, artist from Düsseldorf, art, art Düsseldorf, surrealistische Malerei, surreal, surrealic, art painter, exhibition, art-Exhibition, art-show, represental, Graphic, print, fine art, Gallerist, oil painting, Acryl painting, Collage, Foto, Photo, Vegesack, Photography, von Vegesack, Vita, Biography, Studio.